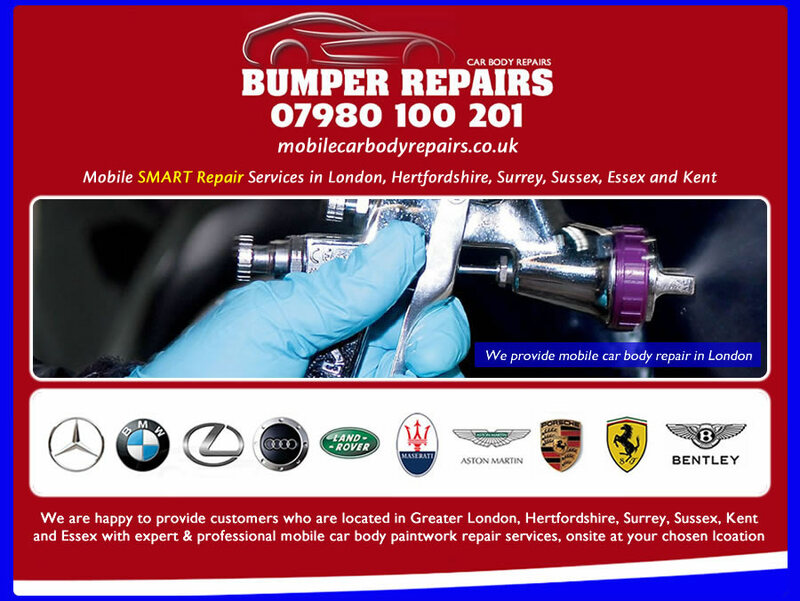 We provide clients with specialist high quality mobile car body repairs in London, Surrey, Kent, Essex, Hertfordshire and Sussex, such as bumper repair, alloy wheel repair, key scratch repair, bodywork dent repair, paintwork scratch repair and other bodywork dent damage sustained to your vehicle. The traditional way of repairing damaged vehicle bodywork involved a lengthy process as the vehicle progressed through the bodyshop, however our our multi-skilled vehicle technicians can complete a range of mobile car body repairs in a fraction of the time, utilising fully equipped vehicles and paint system, meaning we can bring the mobile car body shop to you. Our high quality mobile car body repair, service solution is known in the industry as SMART Repair, but we like to think of ourselves as being a mobile car body shop, where our professional service team provide our clients with a convenient, professional and cost effective, car body repair service. We know that finding a scratch, scuff or dent to your vehicle paintwork or alloy wheels can be a frustrating experience and dependent on the damage, this can also sometimes affect the resale value of your vehicle, so locating a car body repair specialist with experience in repairing and painting your vehicle is important to the long term maintenance of your vehicle. Many of our valued customers are often surprised when they obtain a quotation from us, which can typically work out cheaper than invoking any insurance excess, meaning they do not have to claim on their insurance policy and be negatively affected at premium renewal time.